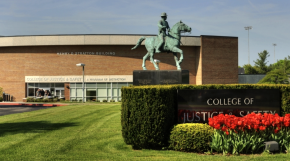 Each year the College honors individuals who have contributed to the fields of justice and safety through their careers and contributions to society. The culmination of these award presentations is the College’s Night of Distinguished Professionals held each spring to honor these award recipients. 2001 – Lt. Col. Lewis Babb, Jr.
1997 – Fred Alley, Jr.